Today is the last day of the month of April and so I’ve started the process of pulling together my metrics for the month with respect to Casual Marketer so I can see how I’m doing against my KPIs. Even before I started this process, I kind of knew that April was going to be ugly – I had a hunch about a week ago that things were not trending in the direction where I wanted them to go, so as I started to dive into the numbers more this afternoon, I wasn’t surprised. I’m not going to get too into it today, tomorrow or the next day I’ll write up my monthly report where I go into it in a bit more detail, but I thought I’d walk you through some of how I think about things when stuff doesn’t meet expectations. Let’s start by owning the outcome. It’s important that you always acknowledge that everything is your fault. There are things like bad luck or events beyond your control that can blindside you, but your job is to mitigate those risks, so you can’t treat these things as an excuse. The month of April from a performance perspective in Casual Marketer is purely on me, so there’s no point in trying to make excuses. Once you take responsibility, you need to look at where you came up short and what was the cause of that. Again, the beauty of these things are that they are all on me. When there are issues that you identify that you ultimately have control over, it makes them easier to fix if you have the desire to do so. I’m not prioritising things correctly to get the outcomes I’m looking to achieve, I’m not focused enough on the things that matter to be successful in this business and as a result of those two things, my execution is poor. They are all vastly different problems, but they are entirely interconnected when you think about it. But here’s a tricky one… What happens if you’ve incorrectly set your expectations? That’s something that I’m starting to contemplate with my own stuff (Casual Marketer in particular) is that maybe, with the benefit of hindsight and context, I’ve set some unrealistic expectations for myself. The easy answer is to say, “Yeah, you’re just quitting” and that’s my initial thought process when I contemplate the question myself. Even thinking about it makes me think that maybe I’m making an excuse for myself and giving up. But let’s put that aside for a second. I used the phrase, “benefit of hindsight and context” to frame this idea on purpose because it’s always important to view things within the overall framework of everything else that’s going on. There is an element of truth to this. With our other businesses, some projects that I have on the go, family life and a full-time job, perhaps I have set some goals for myself that were a bit TOO audacious. Having said all that, in my case, it’s too early to give up or even reset the targets. There’s still a good eight months of the year left, so I am confident I can get my focus, prioritisation and execution sorted out and get back on track. 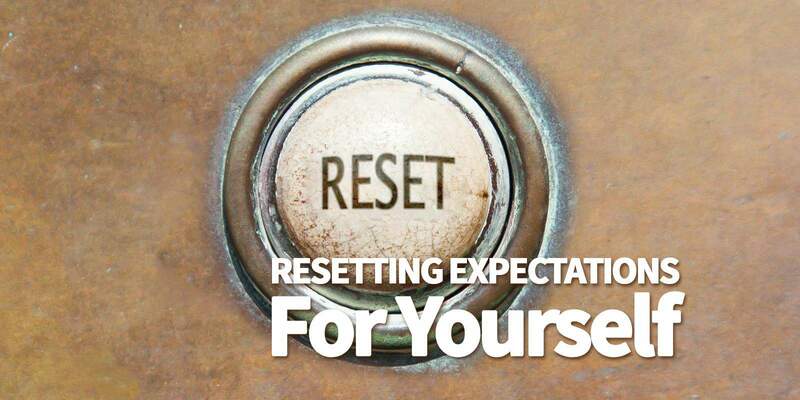 But you shouldn’t be afraid to reset expectations. If you’ve set some goals or targets for yourself and it is clear that you’ve made them unachievable, it’s probably in your best interest to make some kind of adjustment. One of the most depressing thing in the world is to be behind the eight ball early with no chance of recovery. This is where you need to put your big boy or big girl pants on and figure out what your next move is. On one hand, the easy decision is to lower expectations and reset what “victory” looks like under the new circumstances. On the other hand, you can dig in, try to fix what’s broken and push a bit harder. The choice is yours, but personally, I don’t like to give up on something until I know that it is utterly hopeless and that picking a new target will actually improve my odds of further success. Pursuing an unachievable goal actually blunts your progress, whereas setting a target you can achieve with a bit of extra effort tends to motivate you. The last thing I’d say here is, don’t let the calendar become your enemy. That’s something that I’ve thought a lot about over the last week or so when I realized this month had gotten away from me. I started thinking about how my annual targets were going to be harder to achieve now and that I was staring down the barrel of eight months of tough slog not being where I wanted to be. But that “annual” thing is totally arbitrary. Don’t get me wrong, having time boxed targets is vital to being successful, but one lever that you can pull is just resetting the clock rather than changing the target. If you wanted to have 25,000 people on your email list by the end of 2018, well, maybe you can push that out three months rather than lowering the target. This gives you the ability to rethink your plan and reset your thinking around how you execute which opens up a lot more possibilities for success. What you’re trying to do is maximise your chances of being successful more broadly – it’s not just about hitting some arbitrary goals. Those targets are there to keep moving you forward, but if you’re missing them and they have become an impediment to your success, then you need to adjust and reset expectations. In fact, I empower you to do it! Now that you have my permission, go forth and prosper.